Aides scrutinized, sometimes blocked release of documents requested under public-records law. When Hillary Clinton was secretary of state, her staff scrutinized politically sensitive documents requested under public-records law and sometimes blocked their release, according to people with direct knowledge of the activities. In one instance, her chief of staff, Cheryl Mills, told State Department records specialists she wanted to see all documents requested on the controversial Keystone XL pipeline, and later demanded that some be held back. In another case, Ms. Mills’s staff negotiated with the records specialists over the release of documents about former President Bill Clinton’s speaking engagements—also holding some back. The records requests came under the Freedom of Information Act, or FOIA, the public’s main tool to get information from the government. Decisions on what to release belong with each agency’s FOIA staff, say experts on the law, to guard against the withholding of documents for political or other inappropriate reasons. Questions about the transparency of Mrs. Clinton’s State Department tenure have been bubbling ever since it was revealed that she exclusively used a private email account to conduct her work as secretary. 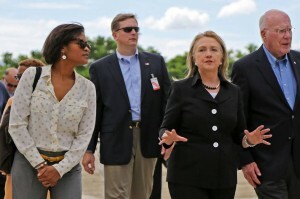 The existence of that private system, which is being investigated by a House special committee probing the 2012 attack on a U.S. diplomatic outpost in Benghazi, Libya, meant the department didn’t have access to her emails when public requests to see them came in. Mrs. Clinton has since given the State Department 55,000 pages of emails she deemed to be about official business. On Tuesday, at a brief news conference in Iowa, she reiterated that she wants the department to release them. Also on Tuesday, a federal judge ordered the State Department to release these emails on a rolling basis, not wait until they are all ready. The State Department, which had planned to release them next January, said it would comply.